We've been using Adobe Lightroom to organize and edit our pictures. We've been trying to take most of our pictures as RAWs. This means that your pictures take up considerably more space (~15 MB) than a normal JPEG (1-3 MB), but edits on RAWs tend to look a lot better then if you were editing the JPEG directly. For a more in-depth discussion of the tradeoffs, SLR Lounge has a pretty good article on the differences between the two formats. 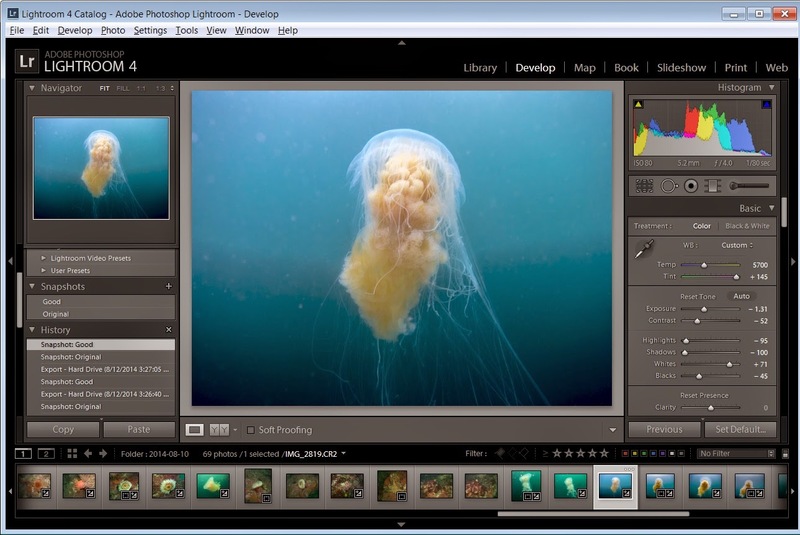 Editing makes a pretty big difference to some pictures - particularly underwater photos, and photos that were over or underexposed. Here's an example of one of our pictures from the summit of Mount Kinabalu (you can click to enlarge). On the left is the original, unedited picture. The center panel shows the result of increasing the brightness on the JPEG vs increasing the brightness on the RAW in the final panel. All that I did to this picture was increase the exposure. Here's an example of one of my jellyfish pictures from our dive at Point Lobos. I took a lot more artistic liberty with this photo. Red light penetrates water the least, so underwater pictures tend to have a bit of a bias towards green. I made it a lot bluer - probably bluer than the water actually was. I also played around a bit with the exposure, whites, blacks, shadows and highlights - basically to try to get the jellyfish to standout a bit more. Here's what lightroom looks like. This is in "develop" mode - most of what I'm doing just involves moving the sliders around and seeing what I like best. Laura's has a copy of Adobe Photoshop as well. Photoshop is a lot more sophisticated and works on a per-photo basis; it doesn't have any of the album management features that Lightroom provides. If you do decide to start shooting in RAW and you're looking for an easy way to organize and edit your photos give Lightroom a try (Adobe offers a free 30-day trial)! PS. Thanks to Marta and Kim for suggesting Lightroom to us (and convincing us that shooting in RAW is worthwhile).